I often use a cooking analogy when I’m writing about writing. That’s because content is a lot like chocolate chip cookies, hamburgers, bread, or anything else where there’s a gazillion different ways to make it. So if you just tell your writer you want bread, you could end up with white, wheat, rye, pumpernickel, even cornbread. All bread, but disappointing nonetheless if you were looking for sourdough. Writing is pretty much the same. There are dozens of ways to write a given piece of content, even if you supply the headline. If you ask two different writers to come up with something for “The Best School Start Times, According to the Experts,” there’s a very good chance they’ll have absolutely nothing in common. Maybe not even the facts, since not all experts agree. You can avoid that by investing a few extra minutes in your content brief (also called a “creative brief”). Going back to the cooking analogy, a content brief is the recipe. It provides the writer with information about what you want, what you don’t want, etc. Sure, there are times when you won’t really care about some of the components…like when you’re depending on the writer for ideation. But the more specific your requirements are, the more specific your brief needs to be. 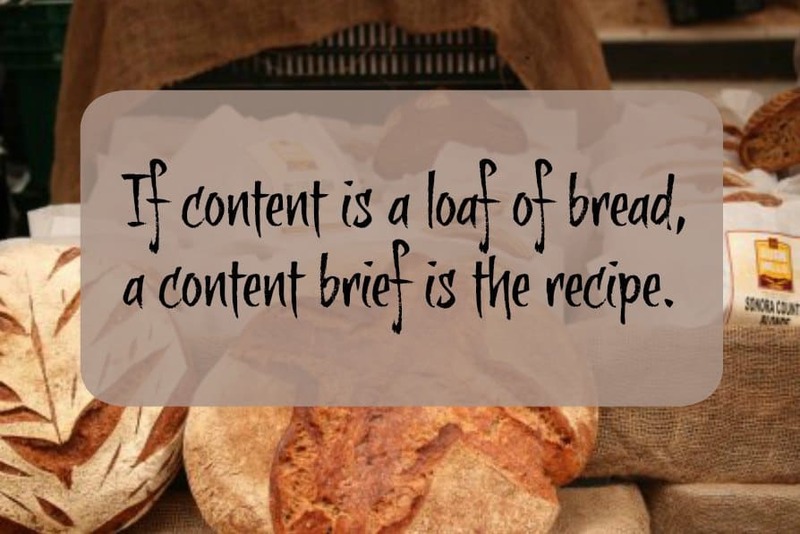 A content brief is your recipe. It provides the writer with information about what you want, what you don’t want, etc. What’s your company culture? Are you hip and laid-back, or are you more formal? What is it that keeps your leaders up at night? Not all of these will be necessary for every piece of content, but, honestly, it’s hard to give too much information. If it’s not relevant to the content in question, the writer will just skip over it. Pro tip: Save your company information as a template so that you can reuse it. What do you want people to do, think, or feel after reading it? And why is that important? Is this piece of content evergreen, or is it time-sensitive? Is it a standalone, or is it it part of a broader campaign? What problem are they trying to solve, or what desire are they trying to fill, when they buy from you? Why will they read this piece of content? What do they want from it? Where are they in the sales funnel? Are they just exploring their options, or are they ready to buy? What’s their level of expertise regarding the subject matter? Do terms need to be explained? Do they need to be spoon-fed? Or does the writer need to be careful not to talk down to them? Will this be a blog post? A white paper? Email? The rumors about the death of keywords have been greatly exaggerated. They still matter. What keywords or phrases do you want the writer to use? And are your choices backed with research? Or should the writer do the research? Are there any specific sources you want the writer to use (usually sources that your audience recognizes as highly authoritative)? Are there any sources the writer should avoid (usually competitors or sources that your audience doesn’t consider to be credible)? Does this piece of content need to reflect a specific theme or message that you’ve been trying to communicate? Should the content conclude with a call to action? If so, what should it be? Whom should the writer contact with questions? Is there anything else the writer needs to know? This list isn’t exhaustive; neither is all of the information necessary every single time. But the more information you provide, the happier you’re going to be with the result. Always share too much rather than too little.